Offering you a complete choice of products which include industrial dismantling joint and bellows dismantling joint. Owing to our immense years of industry experience, we are offering a huge array of Industrial Dismantling Joint that is suitable for many applications including pumping stations, water treatment works, sewage treatment works, meter chambers and gas distribution stations. The provided joint is sternly tested on variegated parameters in order to ensure its quality. The offered joint is designed by using optimum quality raw material and modern technology. By utilizing our years of experience, we bring forth a qualitative array of Bellows Dismantling Joint to our prestigious clients. Our provided joint is designed by utilizing the best quality raw material and cutting edge technology by our experienced professionals. In order to ensure its durability, this joint is strictly tested against diversified parameters. 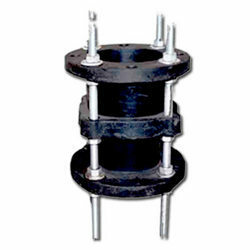 In sync with industry standard, we offer this joint in various sizes and specifications. Looking for Dismantling Joints ?